Hello readers. Still without power because of hurricane Irma! I managed to find a temporary wi-fi connection today! 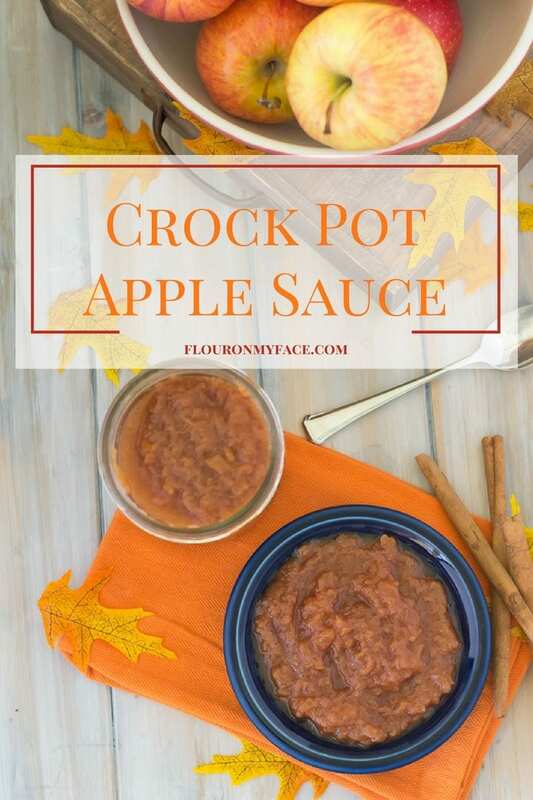 I don’t have a new crock pot recipe for you but I do have the perfect Fall apple crock pot recipe that I shared last year. This Crock Pot Apple Sauce recipe is one of my favorite ways to use up the abundance of crisp sweet fall apples. I can’t wait for the cool fall air to visit us down here is hurricane devastated Lee county, Florida! I can’t think of a better way to enjoy the tart , sweet and crisp flavor of fresh apples then to turn them into Crock Pot Apple Sauce. Crock Pot Apple Sauce is seriously the easiest crock pot recipe you will ever make! Which is your favorite fall flavor? Pumpkin Spice or fresh apples? Are you crazy for the flavor of pumpkin or apples during the fall? I can’t live without my Pumpkin Spice iced coffee during the Fall but I love, love! the flavor of Extra Fancy Gala apples. I used to love Granny Smith Apples the best but I have since fallen in love with the sweet tart flavor of Extra Fancy Gala Apples. I am so jealous of everyone who lives in apple country. I would love to be able to go out picking apples and bring them home to enjoy. I know you all have a bunch of local and heirloom apple varieties that I will never see down here in Florida. 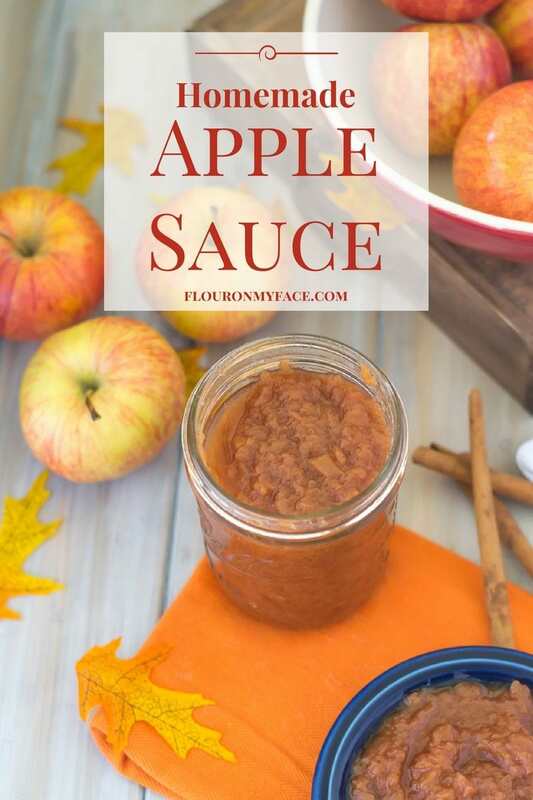 Those of you who are lucky enough to live in apple country will be able to make this crock pot apple sauce recipe with the different varieties of apples that are available to you. You’ll be able to experience flavors of apple sauce I will never have the chance. So make this homemade recipe a couple of times with a different variety of apple until you find your favorite. I’m happy with my homemade Gala apple sauce and will probably make it a few more time this fall. I also made some homemade fruit rolls ups and that is a story for another day! Watch for my Homemade Apple Sauce Fruit Roll up recipe to read about a funny or not so funny experience I had. Prepare a large bowl by combining 2 teaspoons Ball Fruit Fresh with 3 tablespoons of cool water. Mix well and pour into the bowl. Core, peel and slice the apples thinly. Place the apple slices from each apple as you slice it into the bowl and toss with the Fruit Fresh and water to prevent browning. Once all the apples are sliced measure them into a 4 quart crock pot. Add the water, cinnamon and sugar if using. Cook on low for 8 hours or until the apples are very soft. Mash with a potato masher to breakup any large pieces of cooked apple. How to stop apples from browning? Any citrus juice will stop apples from browning once you peel and cut them. Some apple varieties brown much faster than others. When cutting apples for this Crock Pot Apple Sauce recipe or any other apple recipe add some lemon, lime or even pineapple juice to the bowl. As you add more sliced or apple chunks to the bowl give the apples a stir so all sides of the apple pieces are covered in the citrus juice. Any citrus juice with prevent apples or even bananas from browning but if you want to avoid adding the lemon flavor to your recipe I recommend using Ball Fruit Fresh Produce Protector. I love this stuff! It does not add any flavor to the fruit but it will keep apples from browning like magic. Use it when making a fruit salad and the beautiful bright colors of the fruit will stay vibrant. Tou will find it near the canning supplies in most grocery and big box stores. Or you can order it on Amazon. What size crock pot to make apple sauce? 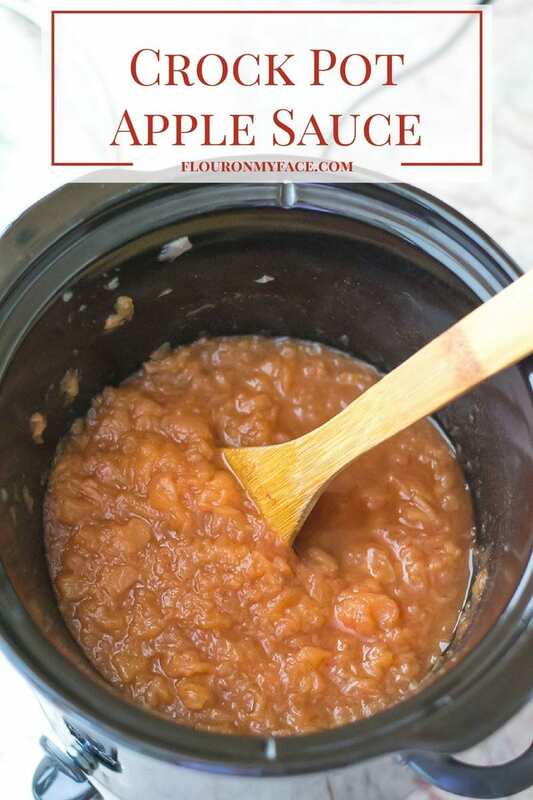 I used my tall and round 4 quart Crock Pot to make this Crock Pot Apple Sauce. 10 cups of sliced apples fit perfectly and cooked down nicely over night. I turned the crock pot on low before I went to bed and when I woke up in the morning I had 2 quarts of the prettiest homemade apple sauce you could ever imagine. The Extra Fancy Gala Apples turned a beautiful color. The color of your homemade apple sauce will depend on the variety of apples you use. Sharing this crock pot recipe over at the Whatcha Crockin’ linky party. Head over for more delicious crock pot recipes! The easiest homemade apple sauce is made in a crock pot slow cooker. 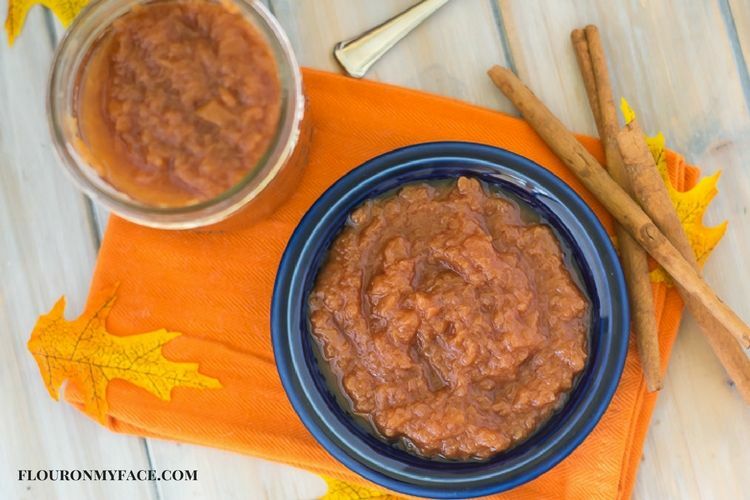 Did you love the Crock Pot Apple Sauce recipe I shared today? 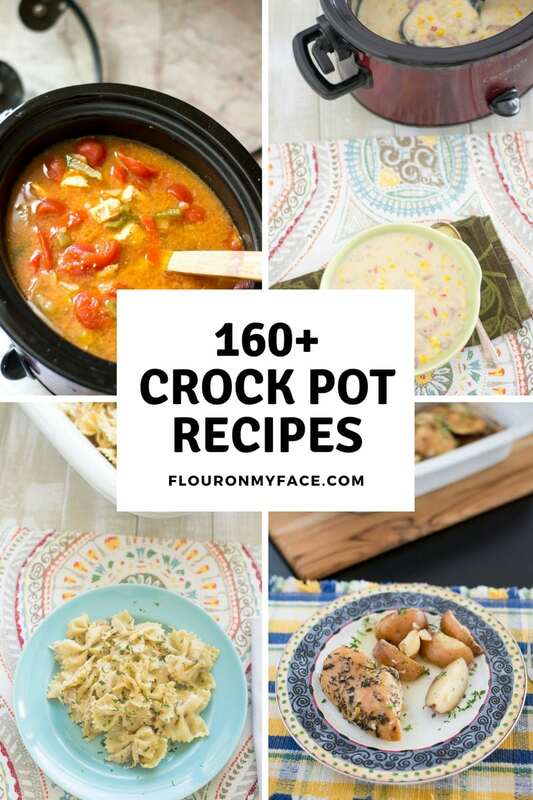 well over on my crock pot recipe page you can find 160+ crock pot recipes. A 6 quart crock pot will work but the cooking time may be shorter. I used one full 4 pound bag plus 4 Gala apples. Golden Delicious apples are a little bigger than Gala apples so you probably won’t need as many. Crock Pot Apple Sauce is one of those recipes that can be made as large or small a batch if you like. Just know that when the apples cook down you will end up with about half as much apple sauce as the amount of raw apples you start with. Thanks for stopping by! Kids love apple sauce and they will get a kick out of watching you make it at home. You could even leave out the sugar all together if the apples are sweet enough. This looks so easy and amazing. Can’t wait to try it. This looks sooo good! I’m going to have to make this with my kids! Leslie your kids are going to be amazed! Thank you! Your recipe sounds good. I’ve made Crockpot Apple Butter which was really good. I need to try this! Thanks for sharing with us at Merry Monday. Pinning. You should try it. I haven’t made apple butter yet but need to.